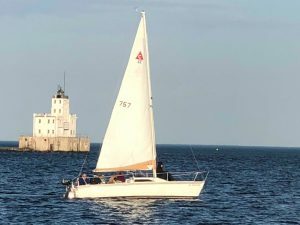 This above title is how the Milwaukee VA Medical Center described the 2018 Vet’s Sailing Program which is co-sponsored by the Milwaukee Yacht Club (MYC) and the Rotary Club of Milwaukee (RCM). The group meets once a week in the evening, learning basic sailing terminology and techniques, and then working together as a crew for a couple hours out on Lake Michigan. Courtney Zeller, Recreational Therapist for the VA, enjoys providing a sailing program to the Veterans who are receiving mental health care. “It’s a great way for Veterans to get out on the water and to forget everything that they’re going through and focus their mind on something positive,” Zeller said. “It’s a great way to build camaraderie. They need to work as team, communicate with each other and all those skills can carry over to their everyday life.” Participating in the eight-week course also allows volunteer opportunities for the Veterans to continue sailing with the race crew committee on other nights, Zeller said.